The Turnpike convenience store at the Beckley exit features fruit as a equal option to candy. “We don’t want to take away anybody’s choices. We just want to add to the choices,” said Mingo County Diabetes Coalition founder Vicki Lynn Hatfield. 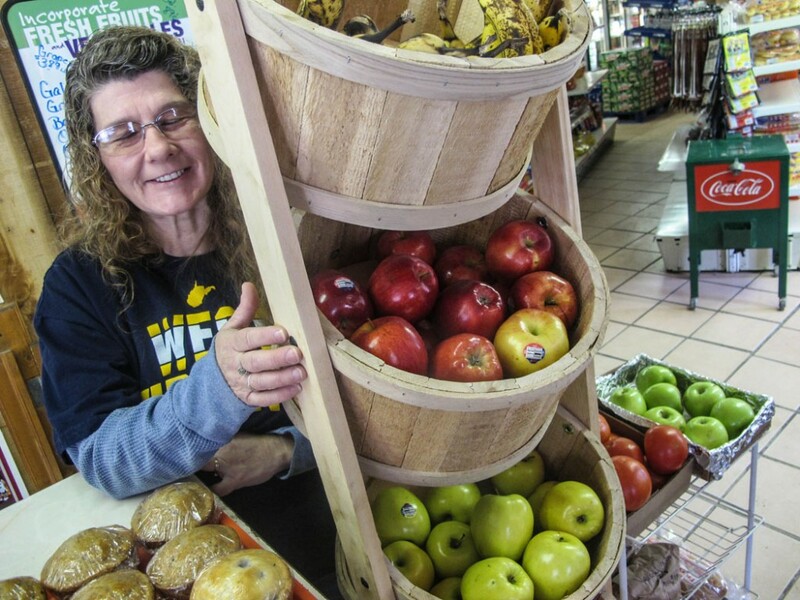 In 2012-13, more than 150 West Virginia convenience stores started offering fresh fruits and vegetables. They got free display baskets from the “Change the Future WV” program of the state Bureau of Public Health. 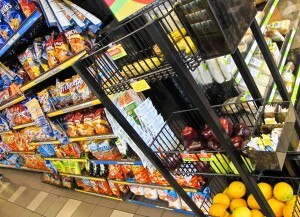 The displays are one way the state is trying to make healthy food more available. West Virginia – like much of the South – has hair-raising chronic disease and obesity rates. Doctors recommend a fresh, healthy diet, but many West Virginians have no grocery store near their homes. Fresh produce at the convenience store helps them eat the kind of diet doctors say reduces their risk of obesity and chronic disease. The statewide Little General chain agreed to display and sell fresh produce. Their sales were so good, the statewide Go-Mart chain agreed to do the same. The fact that fresh produce sells in neighborhoods illustrates two things, Bureau of Public Health staff say: (1) people want fresh produce and (2) attractive product placement can make a big difference in sales. 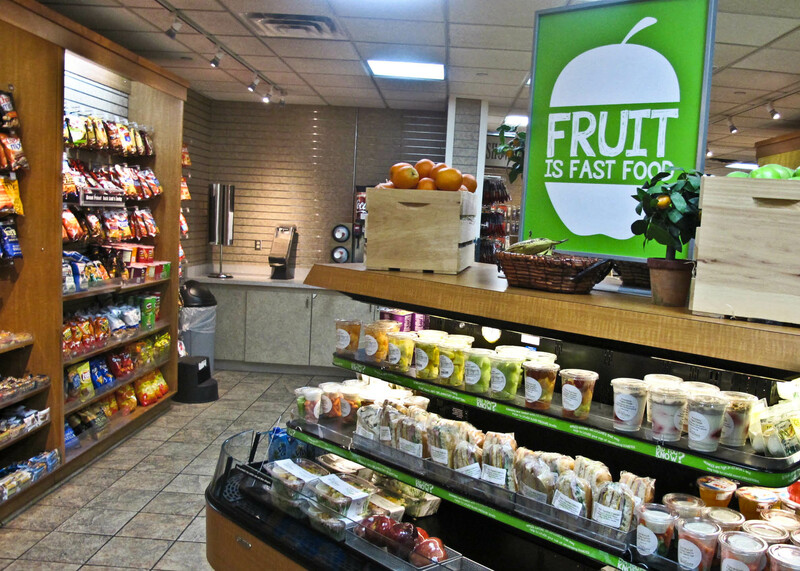 After the West Virginia Turnpike’s Beckley convenience store put up a prominent fruit display saying FRUIT IS FAST FOOD, “customers were really buying those items,” the store manager said. Unfortunately, the Centers for Disease Control ended funding for the Change the Future program nationwide in 2015. But we can still build on their success. Their success stories are at http://www.changethefuture.wv.gov/Pages/default.aspx. 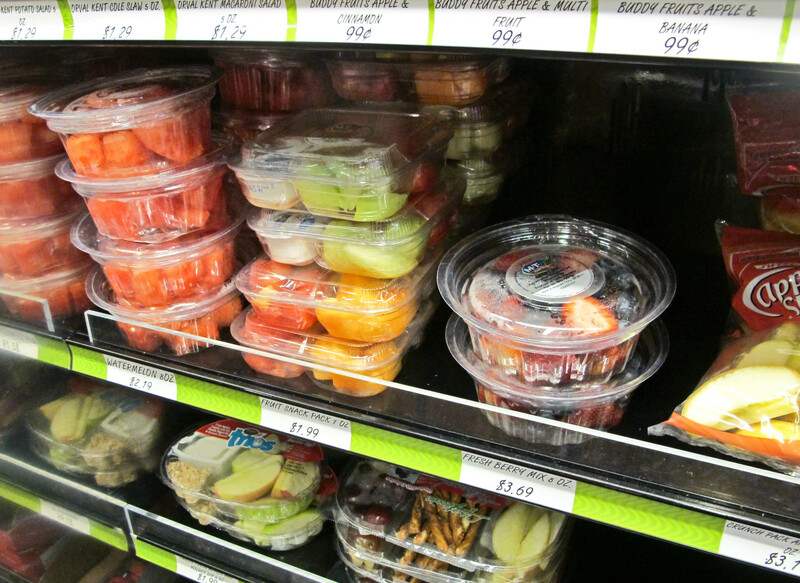 Want to convince your local convenience stores to carry fresh fruits and vegetables? Try the National Healthy Cornerstores tactic. Get people to ask the managers to sell fruits and vegetables. If you want to take it on as a community project: Change the Future source for ordering basket display racks. Fahlgrens Mortine: https://www.fahlgrenmortine.com / info@fahlgrenmortine.com / 1.800.731.8927. You can also build them. The Sheetz chain has started carrying fresh fruit and vegetebles as snack options. Waive a fee for carrying fresh produce. The Mid-Ohio Valley Health Department convinced the Board of Health to adopt a policy that, for each item of fresh produce a convenience store carries, the store’s Retail Food Permit will be waived, up to 100 percent. See if your Board of Health will do the same. “Health on the Shelf:” contains many strategies for getting fresh food into neighborhood stores. Fruit is selling, surrounded by chips and processed food, but it’s there. Here is the West Virginia fresh produce wholesale distributor list, maintained by the state Dept. of Agriculture. Related Try This pages: Healthy checkout aisles and other ways of promoting fresh food in grocery stores; The power of attractive food presentation. Have something to add? Write it in “comments” below, with your contact info, in case we have questions.